Because of the cleanup of fallen trees and power lines in Hurricane Sandy’s aftermath, the township where we live has officially postponed all Halloween activities, including trick-or-treating, until Friday. But because this is the first year in a while that I’ve actually carved a jack-o-lantern, I wanted to put him outside on October 31st to fulfill his Halloween destiny, darn it. 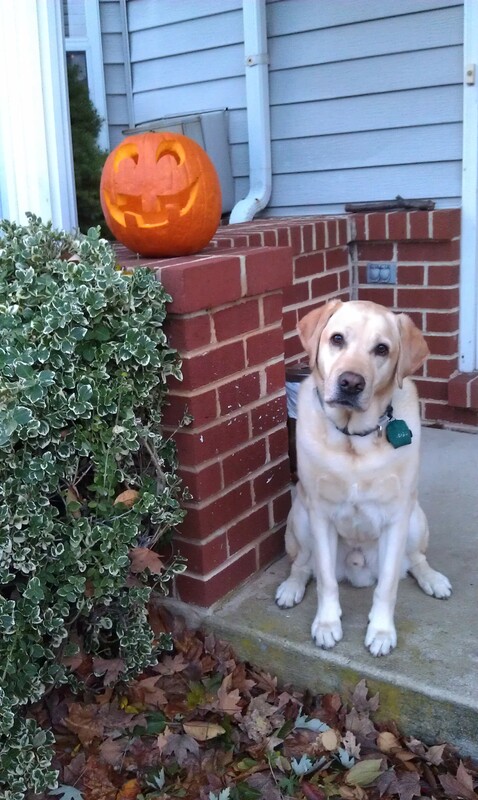 So here’s a quick pic of Truman and “Gourdy,” the world’s happiest pumpkin. We had three or four trick-or-treaters come by early in the evening (because they weren’t sure or hadn’t heard about the date change), but after about 7:30pm, I turned off the porch light and brought in Gourdy’s faux candle. I hope my happy pumpkin lasts ’til Friday. Cute pumpkin! And of course Truman is cute too. 😉 If you have room for Gourdy in your refrigerator, that would help him last until Friday night. I remember my hometown postponing trick-or-treating two or three times when I was a kid because of blizzards. Like you, I thought it was weird that we could just postpone a holiday, but it wouldn’t have been any fun to trudge through all the cold wind and deep snow in costumes on Halloween night. You make an excellent point about blizzards. As for Gourdy, he’s faring quite well on our porch today! Still smiling and not moldy. Must be cold enough out there…. I didnt know you wrre posting more often. We’ll try to remember to keep up. Thanks for tweeting your last post. And thanks for being a cool e-friend? i general. Hee hee! Yes, the boy does get his share of compliments everywhere we go. “Beautiful dog! Gorgeous dog! That’s one good looking Labrador!” Seriously, *I* never get that kind of attention!